Summary: Star Wars: The Blueprints brings together, for the first time, the original blueprints created for the filming of the Star Wars Saga. Drawn from deep within the Lucasfilm Archives and combined with exhaustive and insightful commentary from best-selling author J. W. Rinzler, the collection maps in precise, vivid, and intricate detail the very genesis of the most enduring and beloved story ever to appear onscreen. Star Wars: The Blueprints gives voice to the groundbreaking and brilliant engineers, designers, and artists that have, in film after film, created the most imaginative and iconic locales in the history of cinema. Melding science and art, these drawings giving birth to fantastic new worlds, ships, and creatures. Most importantly, Blueprints shows how in bringing this extraordinary epic to life, the world of special effects as we know it was born. For the first time, here you will see the initial concepts behind such iconic Star Wars scenes as the Rebel blockade runner hallways, the bridge of General Grievous's flagship, the interior of the fastest hunk of junk in the Galaxy, and Jabba the Hutt's palace. Never before seen craftsmanship and artistry is evident whether floating on the Death Star, escaping on a speeder bike, or exploring the Tatooine Homestead. Star Wars: The Blueprints is a limited edition. Only 5,000 hand-numbered English language copies will be available. I rarely feature a book that I haven't read here at Booking Mama. However, I had to make an exception for a new book called STAR WARS: THE BLUEPRINTS. As much as I would have loved to receive a review copy of this book, I can understand why I didn't. 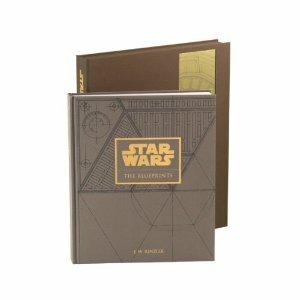 STAR WARS: THE BLUEPRINTS is a limited edition with only 5000 of these books being made. It also retails for around $500, so it's not exactly feasible for the publisher to provide review copies. Despite not seeing the actual book, I do feel like I can speak to the absolute awesomeness of this book. I did receive a package with copies of the actual blueprints. My husband and son (who are both HUGE Star Wars fans) were positively gaga over them (although they wouldn't appreciate me using the term "gaga" to describe them!) My husband just had to show them to his co-worker (also another big Star Wars fan) and my son wants them framed for his room. These blueprints are rather impressive -- even to a "normal" Star Wars fan like me. • The Ewok forest, the battle of Hoth and much more! STAR WARS: THE BLUEPRINTS is no ordinary coffee table book. It is a cloth covered volume which is housed in a cloth-lined clamshell case. In addition, there are more than 500 photos and illustrations and ten 45” x 18” gatefolds. Each copy is individually numbered and also comes with a certificate of authenticity. I'm sure this book would provide countless hours of entertainment and I can only imagine how exciting a book like this must be for a true Star Wars fan. Although the $500 price is a bit steep for many of us, I do think true Star Wars Collectors will find that STAR WARS: THE BLUEPRINTS is well worth the cost. I just wish I had a spare $500 sitting around so I could treat my guys to this for Christmas! Wow, I would love this! It looks great to see the blueprints and see how things were transformed for the movie. How fun. I have a co-worker who would LOVE this book! he would go crazy/gaga over this. Though I have to say $500 is a bit steep! My geeky guys would probably love this one too! Wow. What an amazing book. Wow! If this were a little more affordable, this would make the perfect Christmas gift for my 12-year-old Star Wars fan! Wow! I wonder how many they will sell at that price - I bet quite a few, actually!